World War I Bridges - WW1 Centenary from the river Piave: The 34th edition of the Silent Movie Festival in Pordenone and the Italian war film "Maciste alpino"
The 34th edition of the Silent Movie Festival in Pordenone and the Italian war film "Maciste alpino"
Here is only a quick reminder of the 34th edition of the Silent Movie Festival in Pordenone. You can read the program of this year edition here. Thanks to the long dedication of Cineteca del Friuli to the World War One years, people will have the chance to watch here the 1916 Italian war movie Maciste alpino. It also makes sense to remember that Friuli is the Italian region that suffered from the highest impact during the Great War years and a trip to Friuli always turns into a trip in a wide, crucial battlefield of the eastern front. Here is the PDF grid with the festival program that is not fully devoted to Great War films. Anyway, the mix between Friuli and a part of this program is for sure a good reason to organize a trip there for all people interested in World War One. So if you're travelling in the northeastern part of Italy between the 3rd and the 10th of October you may take into consideration a stop in Pordenone, for this excellent festival directed by David Robinson. Out of curiosity only some notes to finish with the popular Italian word "Maciste", still today in our dictionary: it stands for an extraordinary strong and muscular man and it is a neologism by Gabriele D'Annunzio. 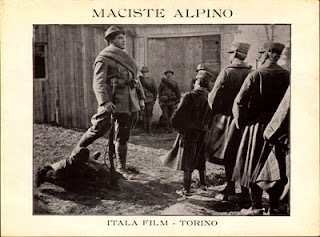 Here below is a video with an interview about the restoration of the film Maciste alpino, unluckily available only in Italian.